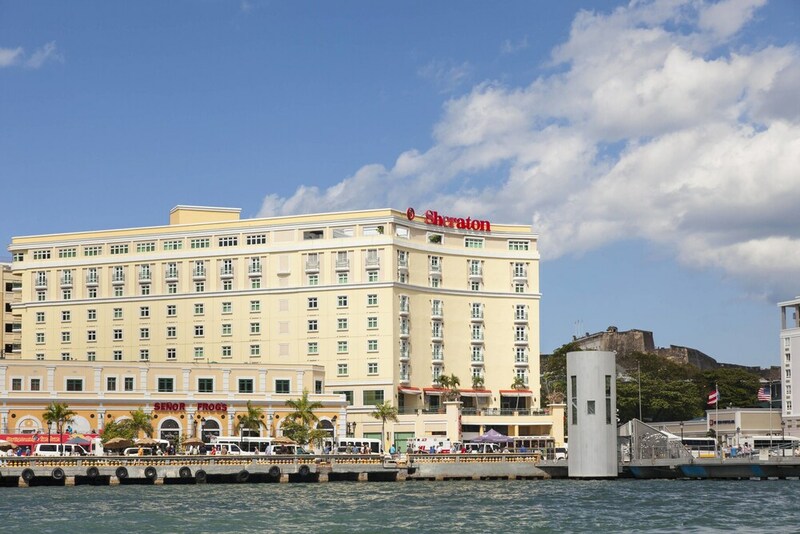 With a stay at Sheraton Old San Juan Hotel, you'll be centrally located in San Juan, steps from Pier 3 and Port of San Juan. This 4-star hotel is 0.1 mi (0.2 km) from Pier 1 and 0.3 mi (0.5 km) from Pier 4. Make yourself at home in one of the 240 air-conditioned rooms featuring LCD televisions. Your pillowtop bed comes with down comforters and premium bedding. Complimentary wired and wireless Internet access keeps you connected, and satellite programming provides entertainment. Private bathrooms with shower/tub combinations feature designer toiletries and hair dryers. Don't miss out on the many recreational opportunities, including a 24-hour health club, an outdoor pool, and a spa tub. Additional features at this hotel include complimentary wireless Internet access, concierge services, and babysitting/childcare (surcharge). Satisfy your appetite for brunch at Palio, a restaurant which specializes in local cuisine, or stay in and take advantage of the room service (during limited hours). Wrap up your day with a drink at the bar/lounge. Buffet breakfasts are available daily from 6:30 AM to 11 AM for a fee. Featured amenities include a computer station, express check-out, and complimentary newspapers in the lobby. Planning an event in San Juan? This hotel has facilities measuring 8073 square feet (750 square meters), including a conference center. In addition to an outdoor pool, Sheraton Old San Juan Hotel provides a 24-hour health club and a spa tub. The hotel offers a restaurant. A bar/lounge is on site where guests can unwind with a drink. A computer station is located on site and wireless Internet access is complimentary. Event facilities measuring 8073 square feet (750 square meters) include a conference center. This business-friendly hotel also offers a terrace, tour/ticket assistance, and multilingual staff. Parking is available onsite for a surcharge. Sheraton Old San Juan Hotel is a smoke-free property. Palio - This restaurant specializes in local cuisine and serves breakfast and brunch. Happy hour is offered. Open select days. This property will enact the following policies for the SanSe Festival January 16-19, 2020: Each guest must register with the property and receive a wristband. A wristband is required for hotel access. For more details, please contact the property using the information on the reservation confirmation received after booking.